Thinking about starting the business of your dreams? So what's holding you back? Is it the fear of the unknown? If you are even contemplating starting a business of your own, perhaps you feel 'stuck' where you are now? But even being 'stuck' can seem better than facing that fear. That fear of the unknown, of leaving that comfort zone. Entrepreneurship is like an uncharted ocean. But ask yourself this question: Do you have the will and determination to leave dry land and navigate the choppy and sometimes daunting waters that lie before you? If so, then Anyone Can Do It can help you tackle some of those fears, to answer some of the elusive questions about what an entrepreneur must face when making the decision to go for (what can sometimes seem like) that unattainable dream. 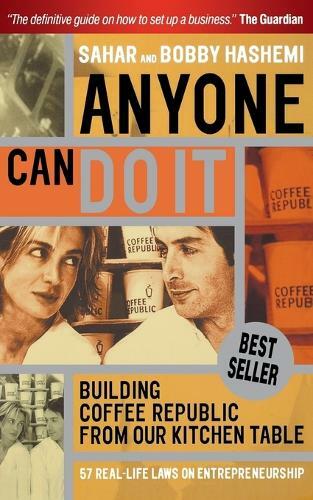 Authors Sahar and Bobby Hashemi are the dynamic brother and sister team who started one of the most recognizable and high-profile brands in the United Kingdom today - Coffee Republic. Sahar and Bobby had to leave their comfort zones too, leaving secure jobs to take the plunge. But this is not a business memoir nor mere corporate history. This is a personal story about two ordinary people who 'did it', and who got it right. Anyone Can Do It is an inspirational book that chronicles the start and evolution of a genuine success story. Sahar and Bobby take you through their first conversations (when the seed of the idea was planted), to writing the business plan, finding a name, raising money, opening the first store, taking the company public and to the present day when Coffee Republic turns over millions, employs thousands of individuals and has over 100 outlets around the United Kingdom. Anyone Can Do It offers a myriad of lessons for aspiring entrepreneurs and blows apart the myth that only 'special' people start successful businesses. It's written in an informal style and packed with tips, advice and quotes. Throughout the text are copies of original business plans, early brainstorms and the cruel and duly ignored bank rejection letters. Sahar and Bobby take the reader step by step through every aspect of starting a business. The process for them wasn't always easy but one thing is for sure, it was the most rewarding journey either of them has taken.